Hello and welcome to this week’s Current Affairs Wrap. We’ve seen tensions increase in the Crimean peninsula, a shocking viral video from Britain, and the Libs continuing to implode back home. Tensions between Russia and Ukraine are heightened again this week following a confrontation between Russian and Ukrainian forces off the coast of Crimea. Russian border forces attacked and seized three Ukrainian naval ships, wounding several sailors in the Black Sea. Russian officials have indicated that the three Ukrainian vessels, two small armoured vessels and a tug boat, illegally entered Russian territorial waters, attempted illegal actions and refused to stop despite several warnings being issued. Merkel’s chances don’t look great, however, with Russia announcing that it plans to deploy more S-400 surface to air missiles to the Crimean region. Vadim Astafyev, a spokesperson for the Russian military, indicated that the new missiles should be operational by the end of the year. Sceptics, however, have rightly pointed out that Trump’s cancellation of the meeting also coincides with his former lawyer Michael Cohen pleading guilty to misleading Congress regarding a Moscow Trump Tower project during Trump’s election campaign. The plea has caused many to speculate that the investigation into possible collusion between Trump and Russia to assist in winning the presidency is gathering more momentum, as it stemmed from special counsel Robert Mueller’s ongoing investigation into the matter. A shocking video was circulated this week showing a 15-year-old Syrian refugee being waterboarded by a bully at his school. The young man, who attends the Almondbury community school in the UK, can be seen in the video being taunted by another student before being pushed to the ground, grabbed by the neck and having water poured over his head in the attack. The incident is allegedly just the latest in months of bullying that Jamal has been the victim of, according to information posted on a GoFundMe page set up to help him and his family. So far it has raised AUD $160,000. Support has also come from UK politicians, with Huddersfield MP Barry Sheerman describing the video as “absolutely shocking” and also tweeting, “Have been supporting the family since it was first brought to my attention.” Jonas Lössl, goalkeeper for local Premier League football team Huddersfield Town FC, also tweeted his support and invited Jamal and his family to come to a game as his guest. Jamal’s younger sister has also been allegedly subjected to multiple serious acts of bullying over the last few months, traumatising her so much that she attempted to slit her wrists. The family reportedly fled the city of Homs in Syria which was under siege between 2011 and 2014 as part of the ongoing conflict in the war torn country. Police have advised that they are treating the incident as a “racially aggressive assault” and had charged the sixteen year old perpetrator featured on the video. Jamal has indicated that he won’t be returning the school and is unsure what the future holds for he and his family. Hopefully the money raised can help Jamal and his family move to a new part of England and try again for a fresh start. The big problem with climate sceptics is it’s very easy for most of them to not throw too much concern as to whether they are right or not, as they’ll not be around to experience the real fallout. That problem will land on our children, and their children. This week our children stood up to make their voices heard and to send a clear message to those in charge. Thousands of school students around the country skipped class to join in a mass protest against the government’s lack of real action on climate change. 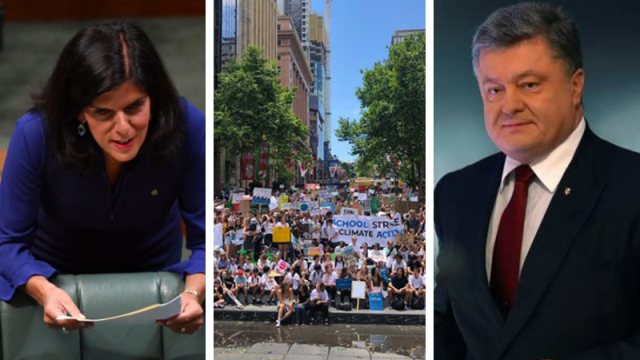 Protests were held in cities across the nation including Melbourne, Sydney, Brisbane, Perth, Coffs Harbour, Adelaide and Bendigo, despite condemnation from the Prime Minister and other politicians. In the lead-up to the protest, PM Scott Morrison urged kids across the country to stay in school rather than protesting things that “can be dealt with outside of school.” He also added, “What we want is more learning in schools and less activism in schools.” Heaven forbid that we raise a generation that are interested in actually addressing issues rather than politically ladder climbing, one knife at a time. Politicians like Canavan are afraid of youth engagement, because one day they will be given the right to vote and it’s clear they will use it with their heads rather than relying on three-word slogans. What should be regarded as a proud moment for our country – seeing a generation of kids who are engaged and educated about real issues taking a stand – was treated with disdain by our supposed leaders. PM Morrison’s discouragement of activism was telling enough, but the most disgusting was yet to come. I try my hardest not to editorialise when writing the Current Affairs Wrap but I can’t stay silent here. Canavan’s comments could quite possibly be the most disgusting and most offensive comments uttered by a politician in this country in recent times – and my God, does he have some strong competition. Suggesting that a politically-engaged youth engaging in activism represents a one-way ticket to the “dole queue” spits in the face of the foundations of democracy itself. These kids have learned more about the world by engaging in this action than they are likely to ever learn in their underfunded classrooms. Not to mention that it’s their grasp of their education that prompted their desire to act rather than accepting the consistent propaganda that this poor excuse for a government consistently tries to shove down our throat. These kids are exercising their democratic right to be heard; trying to quash that makes certain parts of our Parliament unequivocally fascist by definition. I started talking about my family tonight because that is the reason I got involved in politics. I wanted to do something where my children could see the differences that I was making. I hope you can explain to your kids that the difference you are making is stripping them of their voice and their future. While the Liberal Party knew they were going to have a difficult week following Labor’s massacre of them at the Victorian State Election last weekend, it seems they had no idea how bad it would actually be. As the fallout from the election result continued, and with Senior Federal Ministers desperately trying to claim that the recent Federal instability played no part, another bombshell dropped: Liberal MP Julia Banks sensationally resigned from the party and moved to the crossbench. If the resignation that pushed the Morrison Government further into minority wasn’t bad enough, the scathing rebuke she delivered about the party directed the ship into the path of a Tsunami. The party responded as they usually do: with flat out denial about their gender bias and a reminder of how necessary Turnbull’s removal was, without actually giving a reason of course. They then wheeled John Howard out for the cameras to remind us again that we should vote for them because they had a passable Prime Minister a decade ago. Howard predictably defended the party, saying that he didn’t know much about Julia Banks except that he campaigned for her in her marginal seat of Chisholm (which says it all really), before reminding Banks that she owes a debt to the party for her political career. Silly me. I thought she owed a debt to the public because we voted her in, she answers to us and we pay her wages? That debt, on the surface at least, it seems she’s willing to pay by giving us a fresh breath of honesty and being the first politician in living memory to make statements that actually reflect what the majority of the population is thinking.